Utah is one of the most exciting and surprising destinations I’ve ever been to. Visiting the magnificent Zion and Bryce national parks was so awe-inspiring, that I’m now determined to explore as many national parks as I can. This country has so many different landscapes with unique geological formations not found anywhere else in the world, so why not taking advantage of what the homeland has to offer? 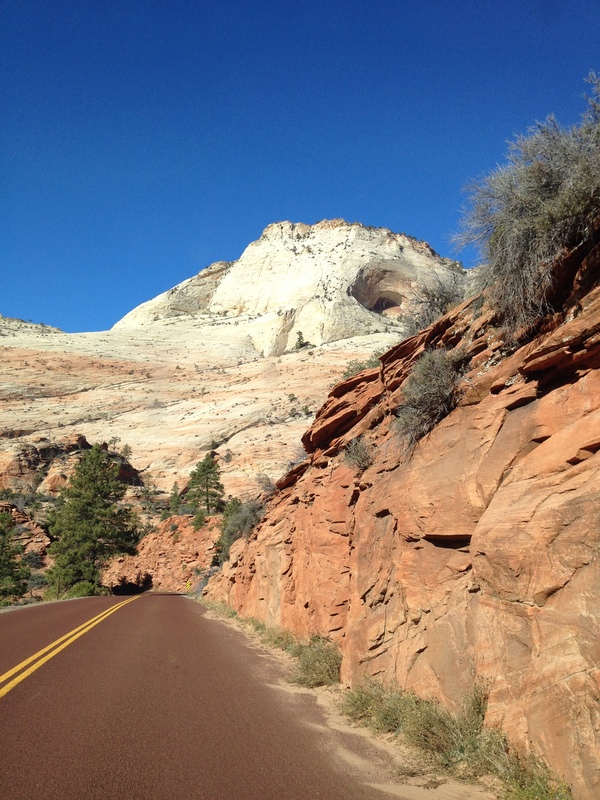 Our adventure began in Arizona where we spent a couple of days in Sedona, visiting part of our family. 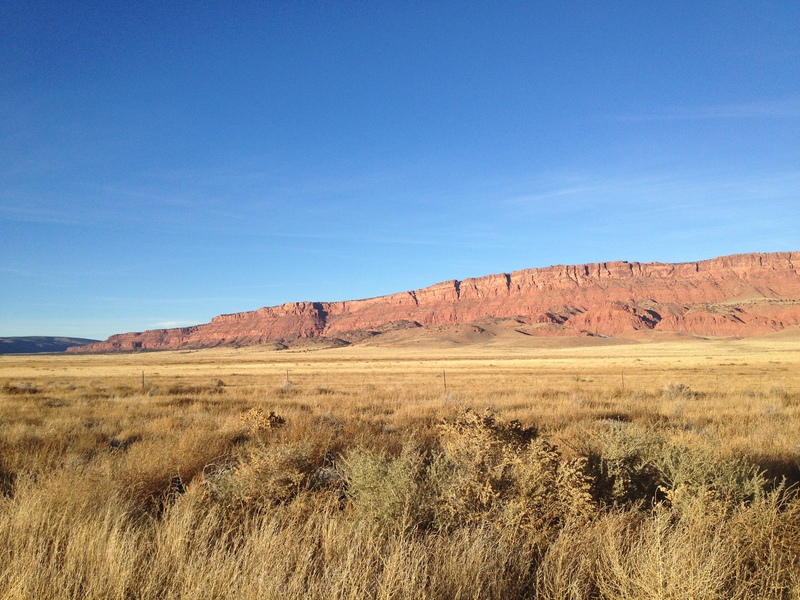 From here, we took scenic Highway 89 to Utah: It didn’t take long to reach the border and when we did, we were greeted by a vast valley with huge red mountains in the back. Words can’t describe the majestic beauty of this landscape — it’s so grand and exotic, but also very familiar … in fact, it looks like the classic backdrop of any Western movie. 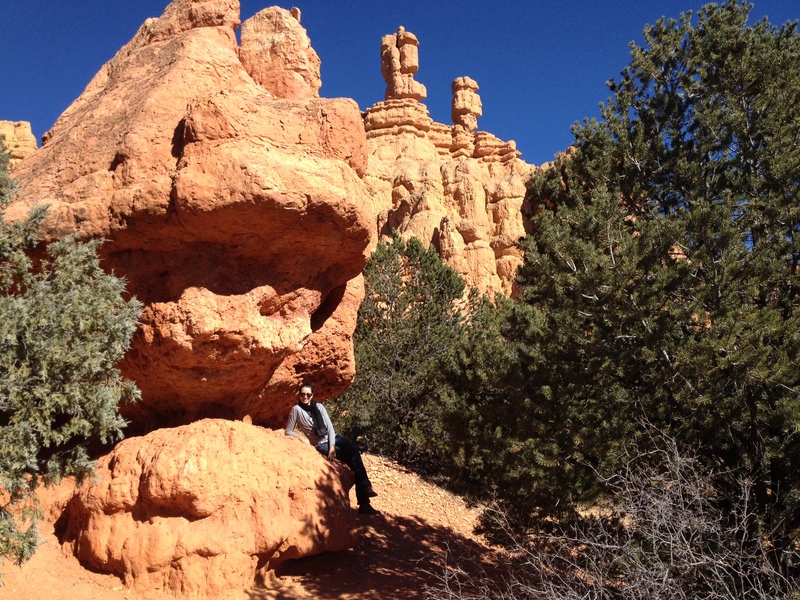 Upon trespassing Utah, I felt I was conquering the Wild West — I was excited to drive through such an iconic land. During a brief pit stop at (where else?) a saloon, the friendly bartender warned us that Utah is not as wild as it seems. She said that liquor would have been hard to buy, unless ordered at a restaurant and that the alcohol limit is way lower in this state. Unfazed, we jumped in our car (I wish we could say horse) and kept driving. Along the way, I noticed a large amount of gun shops lining the main roads. Guns are sold nonchalantly in stores with other improbable goods such as billiards and gas. Go figure! We also spotted many rock and gem stores housed in the most interesting shaped buildings, especially by Zion National Park. Here, the landscape is mostly mountain- and prairie-like with many horses and cattle ranches. We checked into a ranch turned into a resort, where we spent the night at a “cowboy cabin”. We met our fellow “cowboy” neighbors while roasting marshmallows by the communal bonfire. 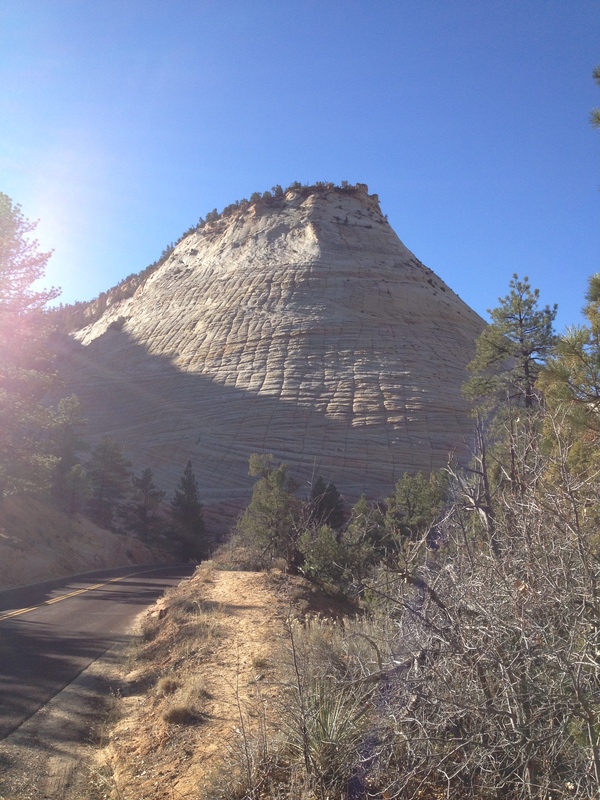 They gave us some hiking tips on Zion and we happily put them into practice the next day, when we entered the park. The deep red, coral, and pink-hued rocks layered one on top of the other like metal sheets, and checkerboard mesas with horizontal and vertical lines sculpted symmetrically on the sides of the rocks immediately caught our eyes. We drove through a tunnel and descended into the valley down to the visitor center where we hopped on the park shuttle (the shuttle is the best way to reach different viewpoints as cars are not permitted). 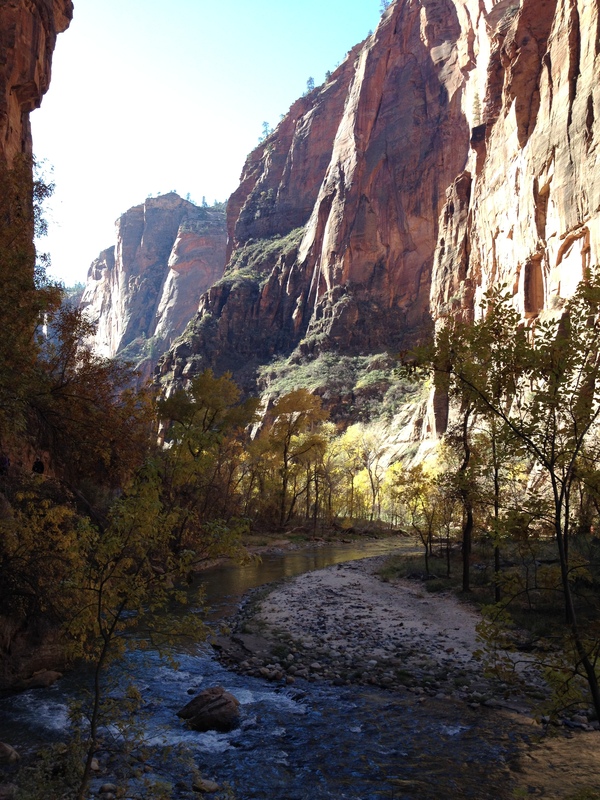 We decided to explore the Narrows first — as the name suggests, Narrows comprises of two tall rock walls open in the middle and crossed by the Virgin River. 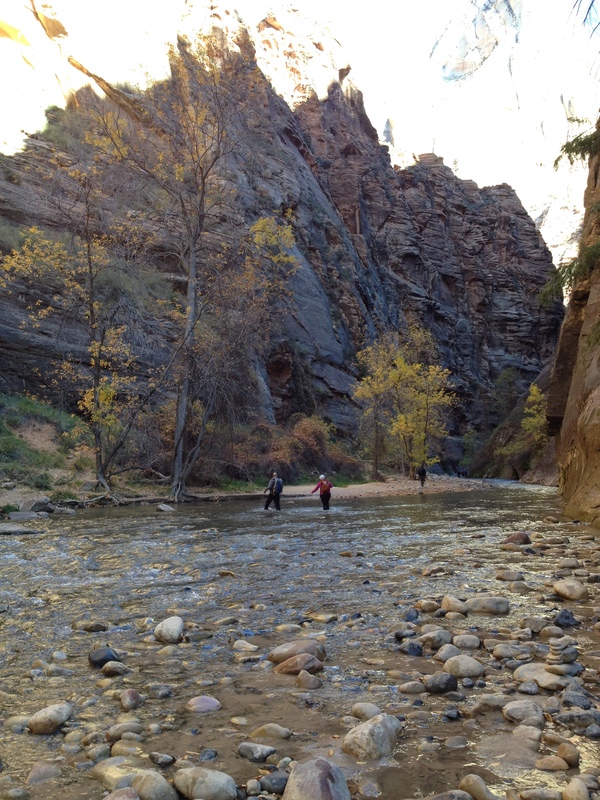 At least 60 percent of the hike is spent wading, walking, and sometimes swimming in the river. We walked as further as we could without getting into the water, but next time for sure I’ll bring a wetsuit! 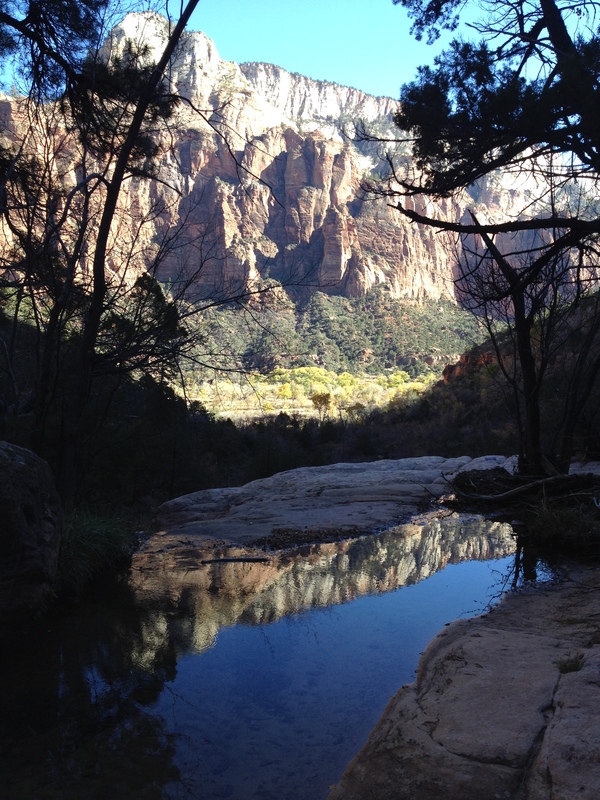 We visited the Weeping Rocks and we hiked the Emerald Pools trail. Waterfalls, pools, and a dazzling display of nature makes this trail a must-see. In the evening, we enjoyed visiting the nearby town of Springdale where we grabbed some dinner and, of course, a beer called “Poligamy Porter” which was actually graded 7. The reason being, is that beers brewed locally can be sold at a higher alcohol grade. 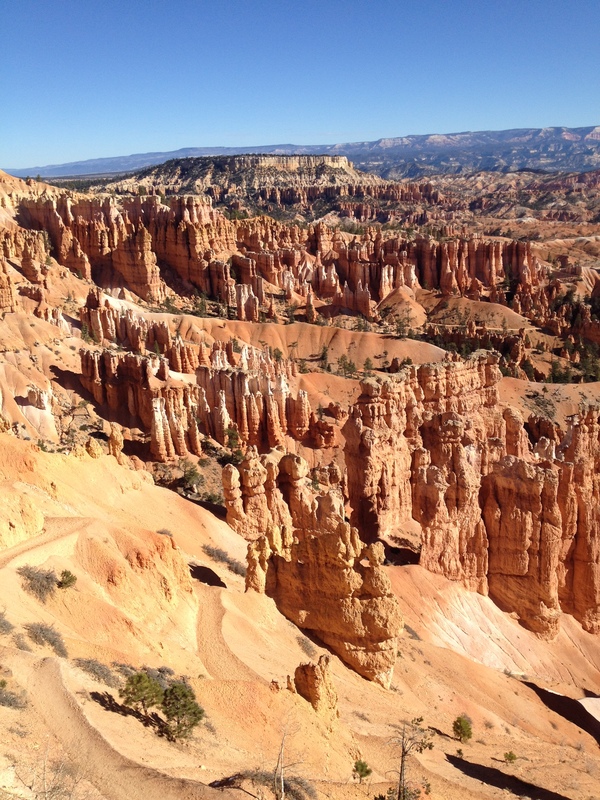 The next day, we drove through beautiful horse country to Bryce Canyon, only about an hour away from Zion. 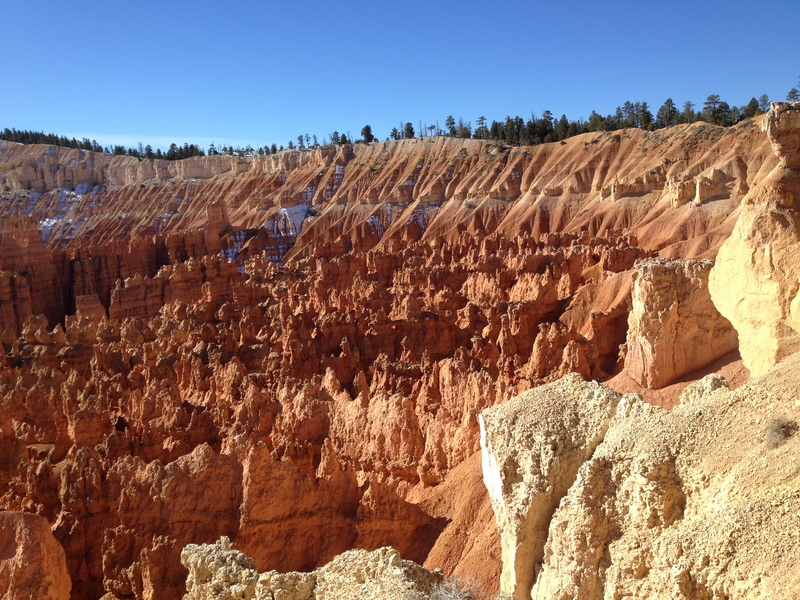 Bryce Canyon is the ultimate wonderland — I’ve never seen anything more spectacular in nature to date. The park, which isn’t actually a canyon but the eastern slope of the Paunsaguant Plateau, features thousands of bright orange, red, and pink carved spires. 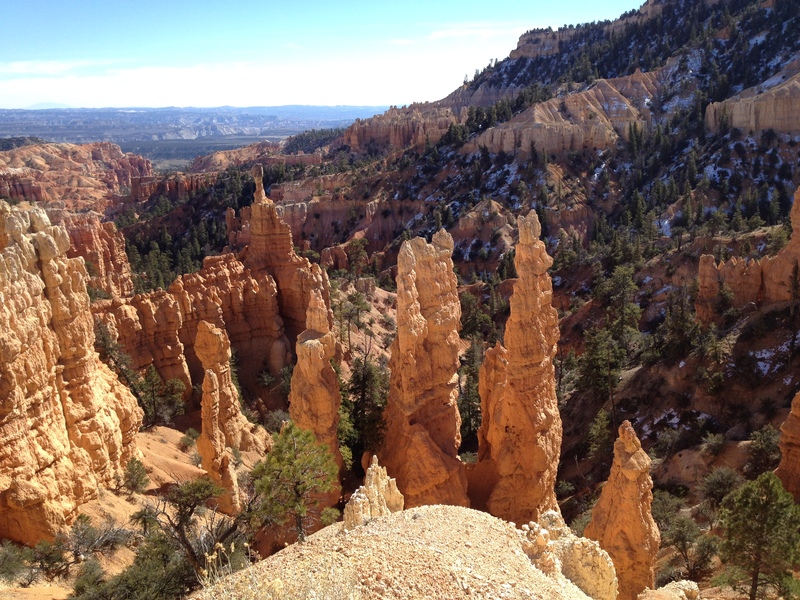 The spires, also called “hoodoos”, are the result of millions of years of wind, water, and geologic mayhem shaping and etching the cliffs and can be seen from different viewpoints along the two hour drive up the plateau. The most sensational ones are found at Sunset viewpoint where they form a colossal amphitheater. 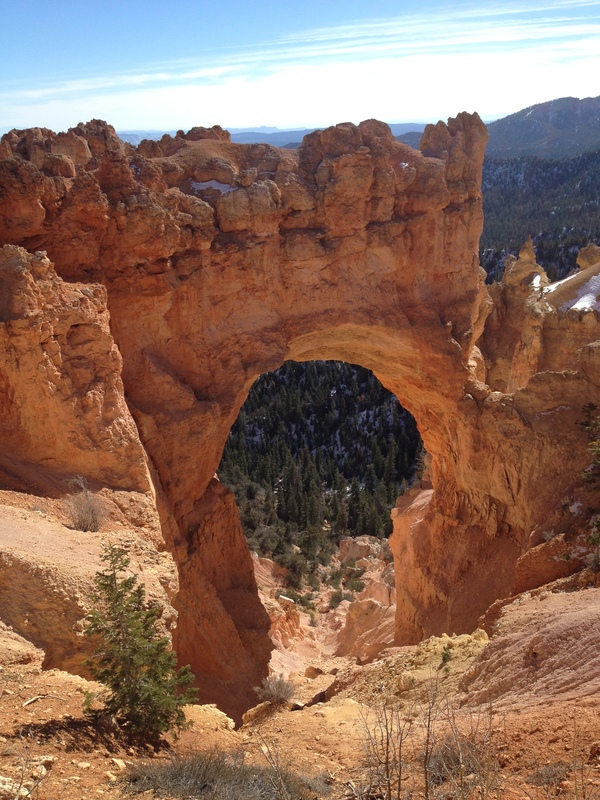 The Natural Bridge is also mesmerizing; it’s hard to believe it’s he work of ice and frost and not man-made. My personal favorite, though, is Fairyland Canyon, the last viewpoint before exiting the park. Hundreds of hoodoos form what looks like a Disney’s castle (well, I guess it’s more appropriate to say that Disney might have copied these guys, as they have been here for quite a while) and there’s even a rock that looks like a sinking ship!! I mean, where can you find castles and pirates at the same place? A legend of the Paiute Indians, who inhabited the area for hundreds of years before the arrival of European Americans, claims that the colorful hoodoos are ancient “Legend People” who were turned to stone as punishment for bad deeds. Surrounded by the beauty of southern Utah and panoramic views of three states, these hoodoos cast their spell on all who visit. So, I wonder … Can I be turned into a princess now? Great pictures! I visited Bryce and Zion a few years ago and was blown away. I’m a Los Angeles Native and even though Utah is relatively close, I had never made the trip. It took my English husband to book the trip and get me to go. He had already been to both several times. They are amazing parks that everyone should see, just stunning! That’s exactly what we did. My husband had to work a convention in Vegas and we just took a week of vacation days after the convention, since we were already part-way there. It really is so beautiful!